The junior wrestler recently earned his 100th victory of his high school career. OLATHE, Kan. — Winning 100 career wrestling matches is certainly not easy. In fact, it's downright tough. However, Olathe Northwest junior wrestler Caden Howard did just that. The 120-pound wrestler bested Washburn Rural's Bowen Murray to win that match and achieve a very solid milestone. Caden was happy about the accomplishment. 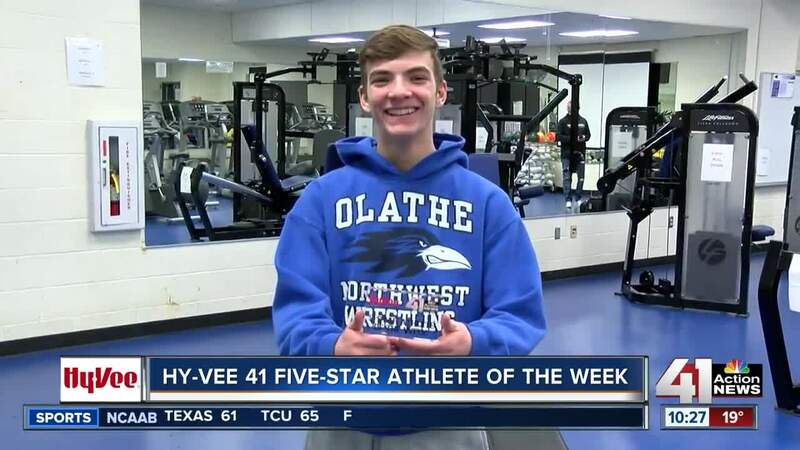 But, he also talked about the hard work and effort it took in the three years he's wrestled for Olathe Northwest. "It's every day coming to the practice room, working hard, getting extra work in with coaches after practice," Howard said. "I've been working towards the goal since my freshman year. And so, it's awesome to finally accomplish it and get it done. "In the first and second period, I scored a lot of points when I was on top. And then, in the third period, [Murray] kind of rubbed me out. So, it was key for me to score all those points in the first two periods for me to win that match," Howard finished. Steve Mesa has been a wrestling coach for 18 years. He's spent the last eight years as Olathe Northwest's varsity head coach. Prior to his time at Olathe Northwest, he spent 10 years at Olathe South. He says he's had the opportunity to coach lots of great and talented kids. But, he spoke highly of Caden and said that he was one of the best wrestlers he's ever coached. Coach Mesa knows how hard Caden has worked to get to that significant milestone in his career. "Winning 100 matches on the varsity level in high school is a pretty good milestone," Mesa said. "Caden did a great job with that this year. He's been really competitive freshman, sophomore, now his junior year. And, he's really taken hold of that 120-pound weight class. He's got a lot more to improve. But, I think he takes that day by day. And, he wants that encouragement and he wants that improvement." The Kansas Wrestling Coaches Association (KWCA) currently ranks Caden second overall in class 6A in the 120-pound weight class. And while he's continuing to perfect his craft on the mat, he's not shy about bouncing wrestling ideas off of his teammates. One person he confides in is junior wrestler Quintin Talbert. He's also been KWCA ranked at various points throughout the year. Most recently, he was ranked 6th-best in the state much of December 2018. Quintin talked about the ideas the two of them share during practice sessions. "One thing I learned from Caden probably would be my high crotch [move] which is one of my best moves today," Talbert said. "He taught me that freshman year. And, probably one of the moves I've taught Caden [is] being better at bottom, getting out, getting hand control." Caden knows that much of his success is attributed to his coaches and teammates and especially praised coach Mesa for his help at developing him the last three years. "Coach Mesa is super important to me [because] every day, he's encouraging me. He's pushing me to get better, working with me after practice, talking to me after my matches. And, it just helps a lot to have him there." Coach Mesa also spoke highly over Caden's character off-the-mat. "Sometimes, he's there to be very positive with his teammates. Sometimes, he's very encouraging [yet] hard on his teammates. And, he's hard on himself as well," Mesa said. "There's a lot of things that he brings to light just for our whole program and pushes himself and pushes others. He can lead by example. And, he can lead, you know, vocally as well. So, that's a pretty good combination."